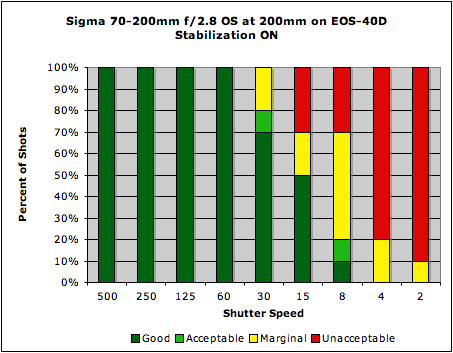 From a practical usage standpoint, the Sigma 70-200mm f/2.8 EX DG OS HSM APO seems to take longer for the lens to get its stabilization operating; you want to be half-pressing the shutter button for a second or two before you actually take the shot. As well, the display in the viewfinder isn't as steady as it was with other manufacturers; the subject is more prone to wandering, as the lens wanders and the IS compensates, so it can be a bit more difficult to achieve precise framing with it. 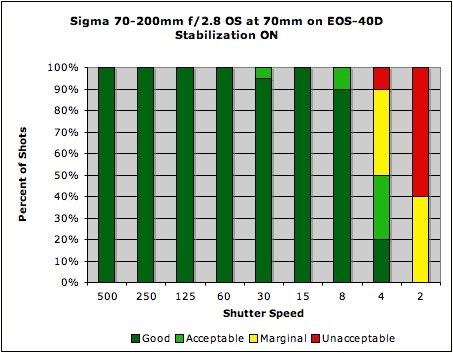 But once it's running, the IS does a pretty decent job, and an exceptional one at 70mm, where in our tests it produced a solid four stops of stabilization. At 200mm, the lens produced results of between 2 and 2.5 stops of stabilization; not too bad, but not as good as other manufacturers at this focal length. 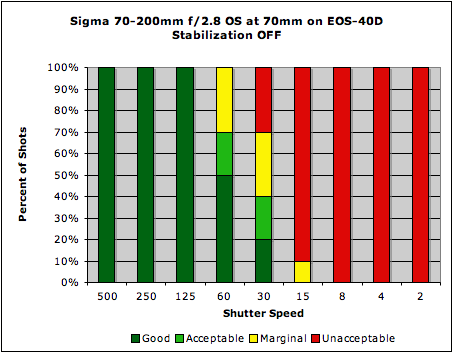 Image Stabilization systems tend to provide more benefit to less-stable shooters than very steady ones, so most users will see the same or greater amounts of shake reduction than we measured here. 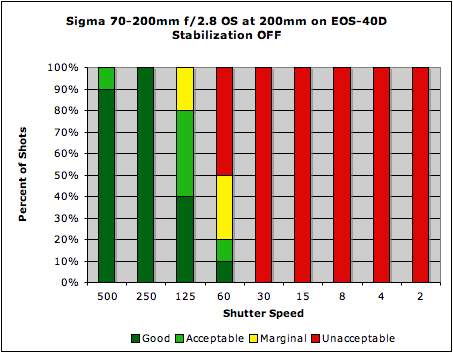 You can read more about our IS test methodology here: SLRgear IS Test Methodology, v2.